Japanese painless needle technique being applied to a patient. Acupuncture is one of the most commonly used components of Chinese Medicine. It involves inserting thin, painless, disposable needles into carefully selected points on the body, thereby eliciting a positive homeostatic response. Acupuncture is believed to move qi (energy, pronounced chee) and blood throughout the body, thereby relieving pain and tension and restoring the body's natural, healthy balance. Acupuncture points are specifically located along meridians (also known as channels). There are 12 primary meridians and 8 extraordinary meridians through which the qi of our body flows. Along those meridians are more than 360 acupuncture points. The points used in your treatment are individually selected based upon your symptoms and accurate tongue and pulse diagnosis. 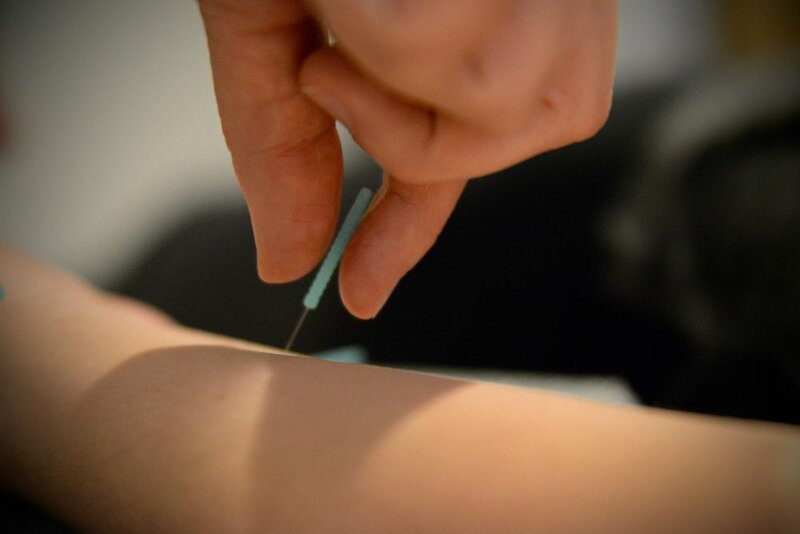 In a typical acupuncture treatment you can expect to have between 4 and 16 needles inserted, and you will relax with them in place for 25-40 minutes. Many people have a fear of needles. They are extremely thin, however, and many people fall asleep during their treatment because it is so relaxing. Chinese herbs are an integral part of Chinese medicine. Consistent with Chinese Medicine theory, they work to restore balance. Herbs possess different properties (cold, cool, neutral, warm, hot, bitter, sweet, sour, salty, bland) and have an affinity to different areas of the body (Lungs, Liver, Intestines, etc). A skilled practitioner will know which herbal formula to use for a particular condition. As a simple example, a cough with yellow phlegm (which in Chinese Medicine is due to heat) would be treated with herbs which are cool or cold in nature, and go to the lungs. A typical cupping treatment will cause redness, which is seen as a sign of therapeutic benefit. This ancient therapeutic modality involves placing glass cups upon the skin (usually the back) and forming a suction. The cups are then either left in place or moved around, similar to massage. It promotes circulation and is commonly used for pain, but is also effective in the treatment of such ailments as asthma, colds and flu. Gua Sha is an ancient technique which can be used for both acute and chronic conditions. "Gua" means to scrape, and "Sha" means rash (aka petechiae). Using a round-edged instrument the skin is scraped until redness, which is believed to be stagnated blood beneath the skin, is brought up to the surface. It is particularly useful in treating and preventing colds and flu, bronchitis, asthma, and muscle tension and tightness. Electro-stimulation involves attaching the needles to an electro-stim machine, which generates a gentle micro-current, allowing for continuous stimulation of the needles. It is used in the treatment of certain pain conditions, Bell's palsy, stroke, numbness and paralysis. Acupuncture Note: your first visit will include a 30-minute consultation and is charged as a 90-minute session.